We have designed Six Weeks of Windows Azure to ensure a company with no exposure to the Windows Azure Platform or Cloud Computing will get plenty of value by taking part. However, we are also focused on given you options between now and then to maximise the value you get from the six weeks. 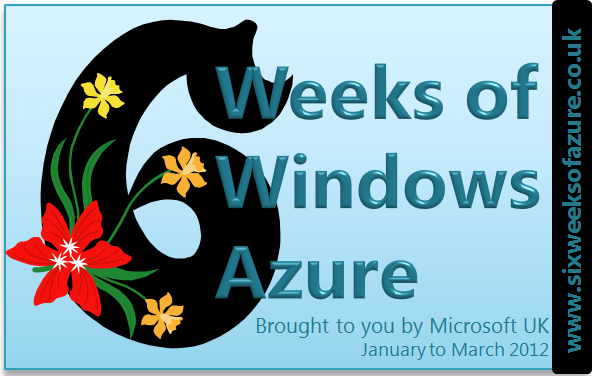 Detailed overview of Six Weeks of Windows Azure and FAQ. SaaS? Cloud? PaaS? Azure? Help! Do you build applications? Are you thinking about Cloud? Are you wondering about how to move to SaaS? Are you considering the Windows Azure Platform? And… you could get all that for FREE from experts in helping companies get competitive advantage from adopting the Windows Azure Platform. Well… now you can with Six Weeks of Windows Azure brought to you by Microsoft UK. Starting in January 2012 we will be delivering 6 weeks of FREE assistance to UK based companies who want to build or extend applications with the Windows Azure Platform covering the commercial and technical aspects of adopting Windows Azure. And the best bit is … you won’t need to leave the comfort of your office to take part. Curious? Then head over to www.sixweeksofazure.co.uk where you will find a detailed overview, a companion FAQ and details of how to signup (It is painless!). Big thanks to everyone who attended my Windows Azure workshop in Birmingham yesterday. Two of you were kind enough to say it was the “best session of the day” – thanks! Shame my laptop twin gpus refuse to be tamed! Send a “technical folk” along to a FREE Windows Azure Discovery Workshop in Reading. Next Nov 8th. On Tuesday David and I delivered a Windows Azure Discovery Workshop in Reading. A big thank you to everyone who attended and asked such great questions – I know David and I really enjoyed the day even if the agenda went out the window early on! Note: We have further FREE Windows Azure Discovery Workshops taking place in November and December if you would also like to explore the possibilities whilst getting a more detailed grounding in the technology. They take place in Reading, are completely FREE and the next is on November the 8th. On Friday David and I delivered a new session as part of a great agenda for the BizSpark Azure Camp. Our session was “10 Great Questions to ask about the Windows Azure Platform”. A big thank you to everyone who attended and asked such great questions – and also to the other speakers for making it a great day. One of the things we discussed was “next steps”. I would recommend the monthly Windows Azure Discovery Workshops if you are new to the platform and would like to explore the possibilities whilst getting a more detailed grounding in the technology. They take place in Reading, are completely FREE and the next is on October the 11th. Hope to see some of you there.